Whether you are a serious athlete looking for an edge or simply trying to recover from an injury, the AlterG® treadmill may be just the tool you are looking for. 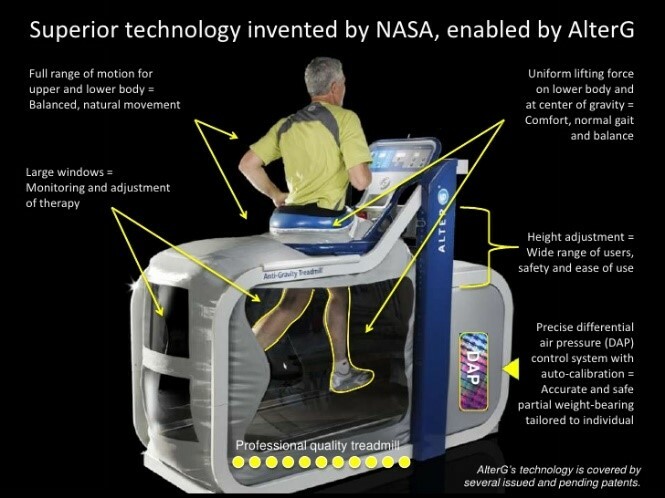 The AlterG® is a NASA designed Anti-Gravity treadmill that allows the user to walk or run in an unweighted environment. This unweighted environment reduces impact and pain, which enables the user to move with ease and confidence as they recover. The Anti-Gravity Treadmill® uses a truly unique technology called Differential Air Pressure (DAP). Essentially a pressurized air chamber counteracts the forces of gravity allowing you to adjust you body weight from 100% to as low as 20%. The AlterG® also has an amazing user interface that provides feedback on weight bearing symmetry, step length symmetry, stance time symmetry and cadence, creating a truly unique training environment. Why is training in an anti-gravity environment helpful? When recovering from an injury, pain is usually the biggest limiting factor in full recovery. Current research has show that the old adage of rest and ice may not be the best way to approach an injury. So, what do we do then? The same research has shown that movement and progressive loading or resistance is the best way to make a quick and complete recovery from an injury. Another aspect of recovery is that pain has a way of creating all kinds of compensation patterns in our movement. If something hurts to do, our brain will re-route that movement pattern away from that pain. This works in the short term, but often this creates chronic mechanical imbalances that lead to problems later on down the line. The unweighted environment the that AlterG® creates is the perfect solution. By limiting the forces of gravity, you can walk, run, or perform other exercises with less impact and pain. Plus, the visual feedback interface limits those nasty compensation patterns that show up. How can I use the AlterG to gain a competitive edge? If you are a runner, a tri-athlete, a spartan racer, a cross-fitter, or anything in between you know the delicate balance between training hard through pain and getting injured. With the AlterG® trainer you can add distance and time to your training routine without the added repetitive impact. As an example; if you are an endurance athlete and you run say 50-100 miles a week you could add 15%-25% to your overall distance without getting that increased repetitive impact. You can also perform speed work outs and hone your technique and form. Athletes are always looking for an edge and the AlterG® gives that edge like nothing else on the planet.